The Chennaiyin FC Under-13 team returned to winning ways with a 2-0 win over Great Goals U-13s at the SSN College Ground in Chennai today. CFC top-scorer K. Karmugilan starred with a brace, taking his tally to seven goals. With this result, CFC have done the double over Great Goals, having beaten them 11-0 in the reverse fixture in the league opener last month. 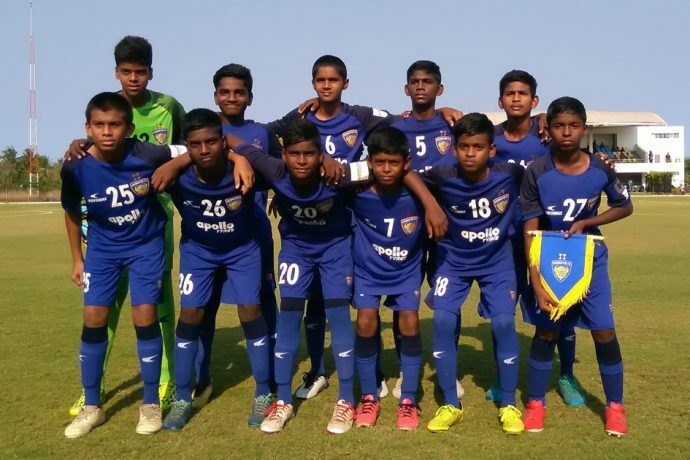 The CFC U-13s’ next encounter will be against Chennai City FC U-13s in an away game at the Chettinad School Ground in Kelambakkam on Saturday 13th April 2019. There were no changes to the Chennaiyin starting lineup from the 1-0 loss to FC Madras three days back. And the hosts started off well, taking control of the proceedings from the outset. Having dominated and created opportunities from the start, Chennaiyin took the lead through Karmugilan in the 17th minute following a defensive mistake by Great Goals. The opponents failed to clear the ball as it fell to Karmugilan, who headed home to open the scoring. It was all CFC throughout the first period with all the action in the Great Goals half. Chennaiyin kept coming at their opponents, and the second goal eventually came in the 32nd minute, again Karmugilan the goalscorer. He combined well with G. Arulesh in midfield, who set up the Pondicherry-born striker in the box for the finish. Great Goals did have rare chance before the half-time whistle. A long ball caught out the CFC defence and found a Great Goals attacker, whose touch let him down as CFC keeper Ajay Kumar gathered the ball. It was more of the same for Chennaiyin in the second period, with Great Goals retreating even further into their half. CFC continued to dominate and create chances, but their finishing kept letting them down. CFC brought on forward E. Kannan for midfielder Ajay Kumar M. Kannan had scored twice off the bench before this game. And Kannan had an instant impact, creating a couple of chances immediately after coming on, but his teammates couldn’t find the back of the net. Great Goals then had a chance to pull one back, a one-on-one chance but the striker sent it wide of the mark. Chennaiyin continued their onslaught following that but couldn’t add to their tally as it finished 2-0.